Thirty pounds of onions and ten pounds of celery was made into 14 liters of juice.The perfect onions were washed and quartered and added to the celery in the cooking pot. Ten liters of water was added to the pot.Material was cooked until soft about 20 minutes and blended into a homogeneous slurry.The slurry was strained through a Victorio food mill. Th residue of the food mill was put through a Champion Juicer to extract all nutrients.The juice was then placed on liter jars and pressure canned at 15 PSI for 15 minutes. 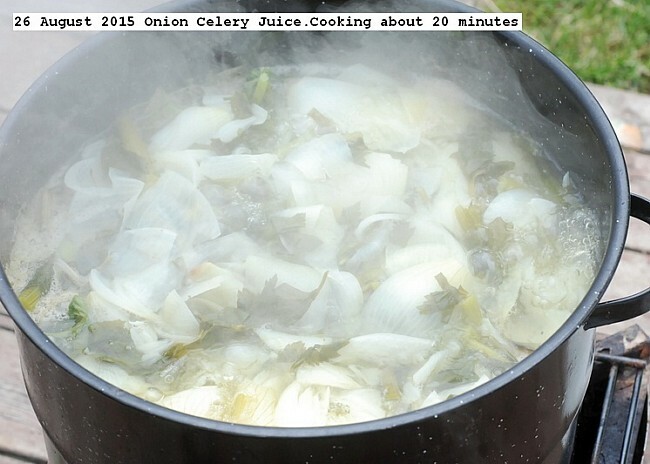 This entry was posted in Uncategorized and tagged Onion Celery Juice, Onion Juice, Pressure Canned Onion Juice. Bookmark the permalink.